If you had a broken arm, you would probably see an orthopedist, because that’s what orthopedists do for a living. They are experts at healing bones. If you’re running a city and have a broken pedestrian network, you would think that the city’s foremost independent expert on local pedestrian issues would have a seat at the table because, you know, they are the city’s foremost independent expert on local pedestrian issues. The Hancock administration recently blocked WalkDenver, the city’s pedestrian advocacy organization, from playing a major role in the city’s forthcoming pedestrian master plan, “Denver Moves: Pedestrian and Trails.” The walkability blueprint will be informed by a 20-person task force that will meet once a month for the next two years. According to the Hancock administration, there’s just no room on the task force for WalkDenver. Everyone in Denver cares a great deal about the future of our city. We’ve heard from several professional organizations, institutions, etc. who would like more representation. At the end of the day, the Denveright leadership team is striving to balance and accommodate expertise, advocacy and passion, while keeping committee sizes reasonable and productive. 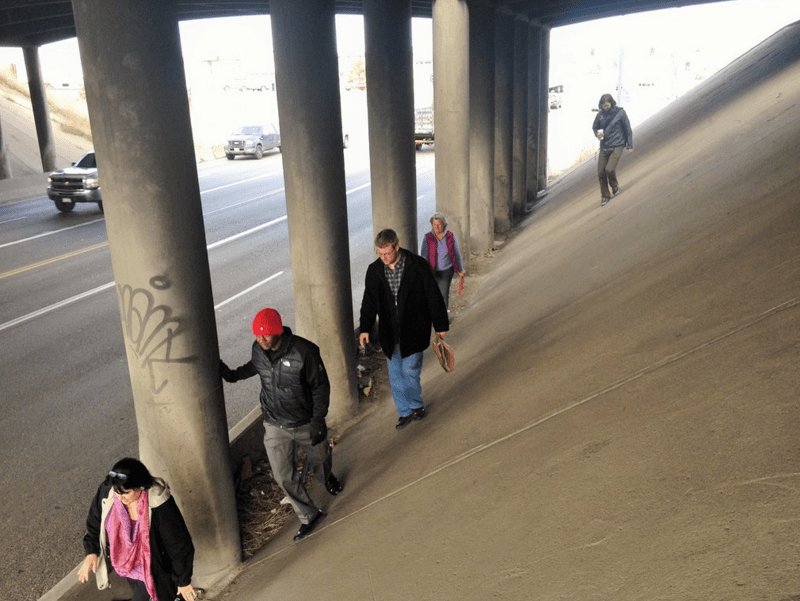 Buchanan also said that the task force includes someone who also sits on WalkDenver’s board, as well as a rep from the Mayor’s Pedestrian Advisory Committee — a group of everyday residents with valuable perspective, but a group that’s also appointed by Mayor Michael Hancock. WalkDenver’s credentials are undeniable. The organization has led the charge for a new policy to fund sidewalk construction citywide, which is gaining steam on the City Council. Its staffers were instrumental in creating WALKscope, an app that maps sidewalk conditions. Via crowdsourcing, WALKscope has compiled a more thorough sidewalk inventory than anything put together by Denver Public Works. WalkDenver has performed a deep analysis of the city’s pedestrian connections to transit, led tactical urbanism projects on Colfax, and surveyed the walkability of neighborhoods for years. The pedestrian plan is part of the administration’s larger “Denveright” planning initiative, which also includes blueprints for transit, the intersection of land use and transportation, and parks. WalkDenver will not serve on any of those task forces, either. The city also snubbed BikeDenver. Neither the foremost pedestrian advocacy organization nor the oldest bicycle advocacy organization in the city will advise the administration on these plans to shape the future of Denver’s streets and neighborhoods. In all, the city appointed 123 people to serve on the Denveright task forces. Apparently there was no room for people whose job is completely devoted to shaping public policy to improve streets for walking and biking. Buchanan encouraged the city’s walking and biking advocates to apply for the “Community Think Tank,” a less powerful entity meant to give laypeople a voice in the process. So there’s that. WalkDenver is excluded, yet the committee includes a WalkDenver Board Member. Huh? Is there a link to the 123 people who were appointed? We need to have their ear. Was anybody from Mile High Connects appointed to Denver Moves Transit? Walking around Denver is comical, since I don’t have to live there. If I were a resident, I’d be perpetually pissed off — the street signage is at the height and faces the direction of oncoming cars, as a human you can’t tell the name of the street you’re walking on. First, I will say this — I believe in working within the systems we have in order to create necessary changes. But not even allowing these advocacy groups to come to the table is a slap on the face and pushes out the very people who benefit the most from it. I wish I was shocked by this news about Mayor Hancock — I’m not. I’m convinced Hancock’s legacy is unsustainable development and creating an environmental disaster with the I70 expansion and stormwater drainage. He doesn’t play well with others. He has failed to include the community on any project, instead he spins it to enhance his motives for the city. His thinly veiled attempts to create a sustainable city is all a show. This guy does not care about the environment, Denver residents, or creating an equitable Denver — all Hancock cares about is making money and moving to his next political office. Good thing he’s pissed off enough people who will never vote for him again. Congratulations Mayor Hancock! You’re on a path to become one of the worst Denver mayors. It’s the same everywhere. You have to fight for every metre, and for every seat at the table. The City of Melbourne does really well in community consultations. They use CrowdSpot technology to gather feedback form users and have a comprehensive and open series of conferences with users. The Walking plan is done now, here’s the link. It has a series of pdfs which cover the process and outcomes. Good luck. I don’t know what WalkDenver’s relationship with the city is like, but this may be better in the long run. I’m seeing a situation in my town where representatives from local advocacy groups sit on the city’s Sustainable Mobility Advisory Panel, and they are very careful about how they get their message out because they don’t want to burn bridges, or ruffle feathers too much. WalkDenver may find it is easier to critique the final pedestrian strategy and the process from outside than they would from the inside.